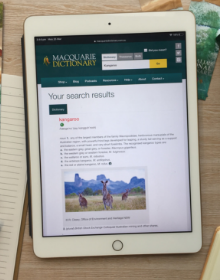 Macquarie Dictionary Online gives access to the complete Macquarie Dictionary Seventh Edition (published in 2017) with twice-annual updates of new words, along with its companion reference the Macquarie Thesaurus. Our online service offers fast and easy access to over 160,000 Australian words and definitions, encyclopedic entries, audio pronunciations for over 120,000 entries, etymologies, usage notes and more. The Macquarie Thesaurus has over 200,000 synonyms. This is the most comprehensive version of the Dictionary and Thesaurus available. We offer 12-month subscriptions to both the Dictionary and Thesaurus, and the Dictionary only. Institutional subscriptions are available for corporations, government departments, public libraries, academic libraries, school libraries and other organisations. Subscription rates apply according to the size of the organisation or institution. Subscribe now, or contact us for further information.